Drama by Design was recommended to the project due to involvement with the University’s Stockwell Street development at the Greenwich campus. We knew we needed a suitable consultant to lead on the design and specification of a detailed and complex AV installation. They understood the client brief to create a flexible student centre which is adaptable and flexible. 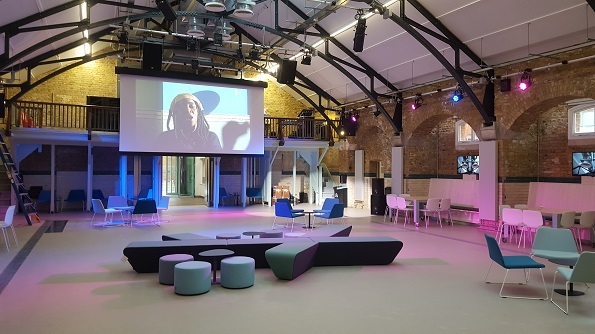 The AV design is adaptable enough to allow the whole building to be used for a single event or divide and used separately as 3 different areas. The building also as different AV needs as it “changes” from day time use as social space, café, meeting rooms to bar and club space in the evenings. The challenge of losing the projects main contractor to administration with a matter of weeks until completion presented a number of challenges but Drama by Design were very helpful in negotiating to keep the AV subcontractor involved in the project and ultimately delivering a quite amazing space. I would have no hesitation in recommending Drama by Design or working with them again.